The sponsorship renewal reflects the success of the partnership between Epson Singapore and GIFC to date and reiterates both parties’ strong and ongoing commitment to youth development. It is also testament to Epson and GIFC’s aligned vision of developing and elevating the Singapore football scene by providing opportunities to nurture local talents. As one of the world's largest manufacturers of computer printers, and information and imaging related equipment, Epson has a long history of involvement with football. 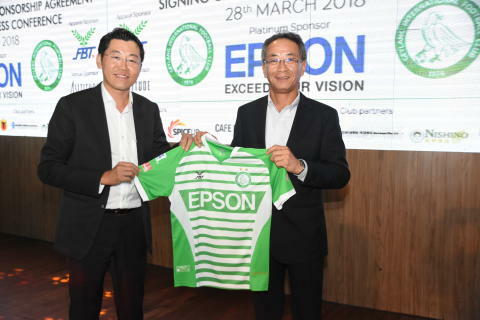 Globally, Epson is a sponsor of sporting icon Manchester United, while in Japan, Epson partners with J-League team, Matsumoto Yamaga FC. This commitment to the sport also extends to Singapore, where Epson co-organised the Epson Youth tournament with GIFC. Under this sponsorship deal, Epson has and will continue to work with GIFC to develop youths through football. One such initiative is Epson Youth Challenge, a youth football tournament held last year, in partnership with GIFC and in support of GetActive! Singapore. Since the inaugural Epson Singapore Cup in 2016, the youth tournament has expanded in size and scope thanks to the support of our partners, and in 2017 witnessed a total of more than 1,200 youth participants. As part of Epson’s partnership with Matsumoto Yamaga FC, Epson and GIFC also sent a total of six youth footballers to Yamaga in Japan for a short training stint where they were exposed to Japanese coaching methods and new training techniques. Two out of the six youths were selected based on their performance at Epson Youth Challenge. The signing ceremony between Mr. Toshimitsu Tanaka, Managing Director of Epson Singapore, and Mr. Ben Teng, Chairman of GIFC was held as part of a pre-season conference today at 1-Altitude, Singapore.